Stop in to BraVo! Restaurant and Café in Portage MI on September 25 from 5 - 7 PM to try the Peregrine Falcon PA during this one of a kind event. The beer is brewed with the Falconer's Flight hop blend that supplies a citrus aromatic blast within an easy to drink brew. Each beer that is sold, Bravo! 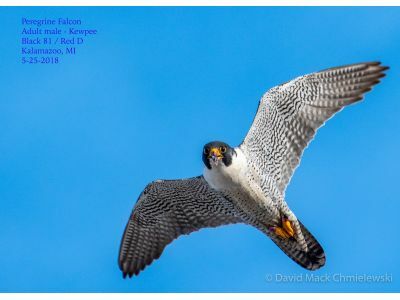 will donate $1 to the Audubon Society of Kalamazoo to help create awareness for the Peregrine falcons that reside in downtown Kalamazoo. Bravo! will also supply some snacks to enjoy while watching slides of this incredible resident at this very special fundraiser. We are ever so grateful to BraVo! for hosting this special event and fundraiser for the falcon cam. Even if you are not a beer drinker, please join us for a relaxing 5:01 get together. Rebecca and Kewpee have been staying close to home base. They each spend time sitting in the nest box and looking out over their territory. It is not hard to spot them in person or catch them on the webcam, but it seems rather quiet now that the youngsters have taken off. Later in the month, I promise we will get out to clean the camera lens which is a bit hazy from all the family activity before the chicks fledged.